Search for your medication from our price list. 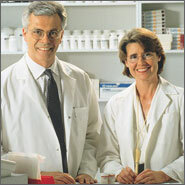 Add your medication(s) to a price quote. When your price quote is completed, click on the option to print the order forms. The order forms will contain the Release Form, Patient Information Form, and Prescription Medication Order Form containing your price quote. Our order forms are also available in Adobe PDF version. Mail (or Fax) us the completed forms. You will also need to mail us your Doctor’s written original prescription, or have had your Doctor to fax or e-mail an official prescription to us. It is recommended that you obtain a 3 month supply to maximize your savings along with additional refills. Your order will be sent to the shipping address on your order form. Shipping costs are $14.00 US funds (Canada/USA) for your entire order and may take up to 3 weeks for delivery. SmartMed.ca is pleased to announce that we have joined the MedsForAmerica group of companies!